Each week I will be making a bread recipe from Peter Reinhart’s wonderful book, The Bread Baker's Apprentice: Mastering the Art of Extraordinary Bread. The fifth recipe in the Bread Baker's Apprentice Challenge was Casatiello. This bread is Italy's answer to a brioche. It doesn't quite contain as much butter as a brioche though. So it is easier on the old waist line. 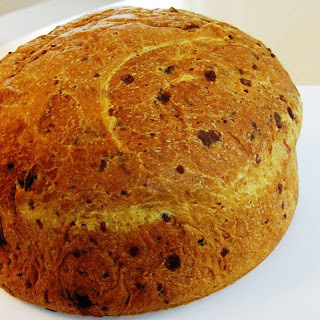 :) Casatiello is a savoury bread that is traditionally made with meat and cheeses. The bread is perfect on it's own served with a nice salad and a cold glass of beer. For my Casatiello, I added crispy pancetta cubes, shredded provolone cheese and finely chopped rosemary. The dough came together easily and it rose beautifully. I baked it in a 9 inch springform pan and it baked into a tall, lovely boule. You know, I think I might just be getting the hang of this bread baking business.....(famous last words). 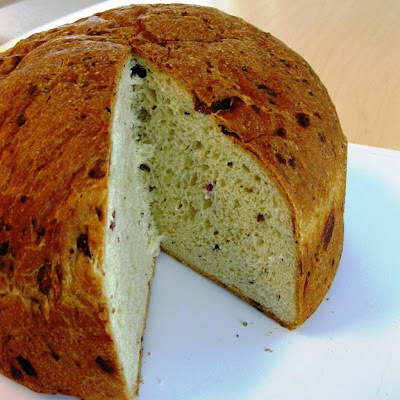 I really loved the Casatiello bread and I think it is my favourite one so far. Be sure to check out what the other challenge participants have done. What a wonderful bread! Really tempting! Wow the bread looks super super huge and delcious. I have seen the recipe in the book,but was reluctant to make them as i have nver made a savoury bread. oh that bread turned out beautifully! Thats a prefectly bakes and beautiful bread! Love your famous last words as much as I love the loaf..tall & handsome! Wish I could get so much breaded confidence too Paula! What a beautiful bread! I love your baking adventures! Keep the great posts coming! Delicious bread! Looking forward to the challah recipe. You just keep getting better and better. Whatever you're doing, keep it up! I love the addition of rosemary! Your casatiello looks beautiful! Great job. Perfect with a beautiful picture to go with it. Beautiful bread! Mine ended up looking like a bad acne attack. This is such a perfect loaf. I can taste it now with some good butter. This bread looks just delicious! Such a beautiful brown crust! Mine was rather pale in comparison. And rosemary sounds like a great addition. Terrific job! Oh, a loaf of bread packed with pancetta, provolone and rosemary would be gone in no time around here! Great job, it's so pretty! That sounds so good with the pancetta, provolone and rosemary! I loved this bread! I am doing the BBA challenge also and really enjoying it.